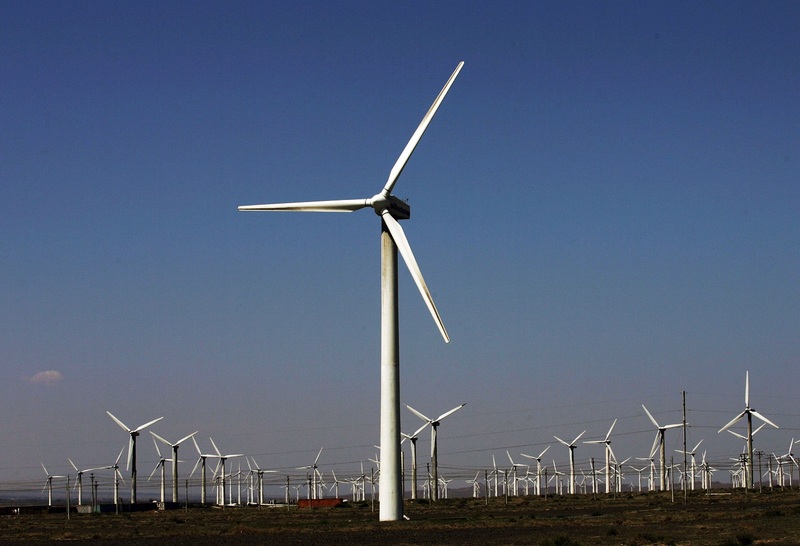 Wind turbines at the Dafancheng Wind Power Plant, in Dafancheng, Xinjiang Uigur Autonomous Region, September 2, 2007. It is important to get the question in proportion. The U.S. makes a claim of leadership on global climate policy, but its national targets are comparatively soft and its history of engagement in the United Nations Framework Convention on Climate Change effort patchy, to put it kindly. President Clinton signed up to the Kyoto Accord in 1997, but the U.S. Senate refused to ratify it, claiming, as Trump did in his Rose Garden speech, that it would damage the U.S. economy. Seasoned climate diplomats recall that the U.S. has routinely applied the brakes in climate negotiations, watering down pledges and weakening ambition, behavior that others have accommodated in order to keep the U.S.—for most of this history the biggest emitter of greenhouse gases—at the table. Although things improved under President Obama, the raw numbers still do not support a claim to leadership by example. In addition to being the biggest source of historic emissions, the U.S. still has per capita emissions double those of Europe. EU members have collectively pledged to cut their emissions by at least 40% by 2030 on a 1990 baseline; the U.S., in comparison, gave itself a pass for a further 15 years, setting a target for Paris of a reduction in emissions of only 26-28% on a 2005 baseline. It is a commitment that is not only lower that that of the EU, but also 2% lower than the offer the U.S. itself made in 2010. Where U.S. leadership did matter, therefore, was not as a pace-setter in cutting emissions, but in the power of its diplomacy to mobilize, and on occasion to coerce, laggard countries into line. It was, until Donald Trump, a force to be reckoned with. The Paris Agreement would not have happened without U.S. commitment, or without the greatly enhanced U.S.-China climate cooperation achieved under the Obama administration that turned an antagonistic and finger-pointing relationship into a positive one. China had made no binding commitments under the Kyoto Protocol but, as a developing country, it had no obligation to do so, however frustrating that was to those who marked the steady growth in China’s emissions. China has been the world’s biggest emitter of greenhouse gases by volume since 2006, and its per capita emissions have surpassed the EU’s. But it is also now committed to a series of energy efficiency targets, including to cut emissions per unit of GDP by 60-65% of 2005 levels by 2030, and to peak its emissions by 2030 or earlier, a promise that it can comfortably meet: China has pledged to source 20% of its energy from low-carbon sources by 2030, which will potentially allow it to peak much earlier. China remains committed to the Paris Agreement, not only because the leadership understands basic physics and the dangers climate change will bring, but also because it is eager to exploit the opportunities that a potentially multi-trillion dollar market in low carbon goods and services will offer. China has been positioning itself to dominate that market for nearly a decade. It is a core element of China’s economic and industrial strategy and a change of heart is extremely unlikely. Nor is there likely to be any change of mind over its domestic environmental commitments: “ecological civilization” has become a key slogan in a presidency increasingly promoted at home as ideologically significant. Cleaning up China’s heavily polluted air, soil, and water is an urgent and Herculean domestic task and the challenges are closely connected to climate policy: coal is a major source of carbon emissions, as well as an important contributor to air pollution and a greedy user of China’s scarce water resources. Last week, for example, China’s Ministry of Water Resources imposed a three-year moratorium on diverting water for several water-intensive industries, including coal mining and the manufacture of several coal-derived chemicals. The continuing decline of China’s coal use—at home at least—seems assured. But how far will China’s continued commitment add up to the level of leadership that could fill the space created by the U.S. retreat? This is a rare opportunity for China to bid for the moral high ground, and Xi’s and Li’s carefully crafted speeches were tuned to the anxieties of a world disconcerted by the erratic behavior of the U.S. president, stressing as they did China’s commitment to the rules-based approach to climate action. China is already the world leader in solar and wind investments, last year spending $100 billion on clean energy, with a record $32 billion in overseas investment deals in 2016. This is certainly a leadership role, but there is an important gap between this and the task of stimulating a further leap in global ambition. The pledges under the Paris Accord are voluntary and the only sanctions for failure are moral. The agreement was designed to be inclusive, but also to demand a rapid increase of ambition in order to meet the stated goals of limiting global average temperature rise to less than two degrees centigrade. Temperatures have already risen by more than one degree centigrade above pre-industrial levels, and the dramatic impacts of that rise are already evident. The need for the radical ratcheting up of emissions targets that was the intended next phase of the agreement is urgent, but mobilizing such an effort is not a skill that China has practiced in the past. Absent the stimulus of U.S. pressure to go further and faster, China is unlikely to unilaterally volunteer radical emissions cuts: like any other country with jobs and investment tied to fossil fuels, China has domestic resistance, if not to the direction of travel then certainly to the speed. Climate cooperation between the U.S. and China was a key element on the road to Paris, beginning with their joint statement on climate change in 2014. It thrived even when other aspects of the bilateral relationship came under strain. Without it, China is seeking new climate partnerships, including in the EU, not least to demonstrate to its own domestic laggards that international expectations remain high and the rewards of cooperation have not diminished. But although the mood music on climate was positive in the recent EU-China summit, disagreements over other issues such as access to China’s markets for European companies proved as intractable as ever. Despite a shared view of the critical importance of climate action, these continuing frictions will constrain China’s potential for leadership. China’s limits will partly be determined by its own domestic politics, but also by its lack of transparency and its continuing protectionism, all of which will continue to generate tensions even among partners keen to cooperate. Many countries welcome partnership, but far fewer will embrace China’s political norms. China has been thrust into this new role prematurely and by default; it is unlikely to welcome the scrutiny that global leadership entails, and will set limits to expectations of its performance in a role it did not seek. For the time being, that will have to suffice.